Got this idea from my daughter bursting into an emotional cry over her stickers being used up. Devastation of a 4yr. old! So, I made a book out of wax paper. She can now stick her stickers, take them off, move them around. Store them on the back page. Versus The Stick and Stuck. Sometimes you can get stickers cheap, but there’s those days in which those Puppy Eyes want the $4.99 pack of Frozen Stickers, that only contain 1 sheet, you later find out! In which gets used up in less than a minute. Not forgetting if 1 kid gets stickers, they all want them! You can trace, with Perm. Marker, pictures for them to decorate. Or a teaching tool. With spelling, where kids fill in the blanks to complete words, using letter stickers (I used address labels for black letters, bought fun letter stickers for them to fill in.). So many things that can stem from this. My daughter makes all sorts of stories and is able to move them around for more stories. That I get to hear about for the next few hours. Which is quite hilarious, with her imagination. This craft expands the life of sticker use. Thus saving us parents money and the 4yr. old’s devastating loss of sticker use. 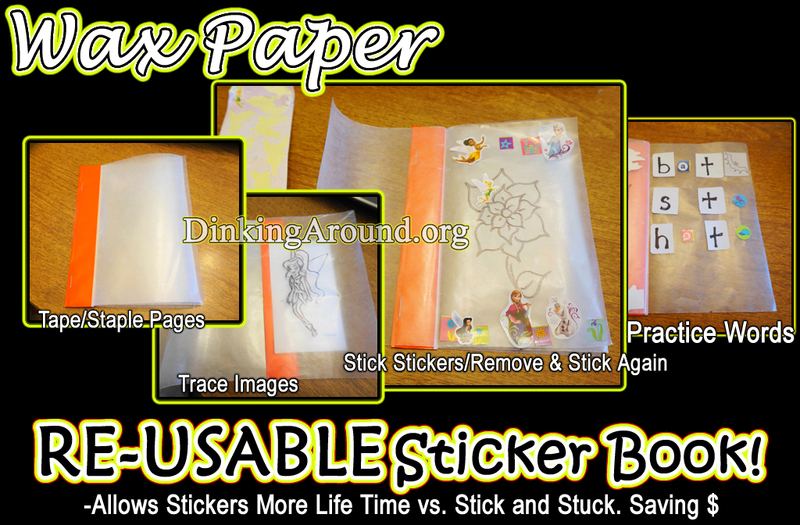 This entry was posted in Parenting, Tips & Ideas and tagged reuse, reuseable, save money, sticker book. Bookmark the permalink.